Gravel driveways are hands-down the most affordable option upfront. Asphalt driveways place second in cost, followed by cement and pavers. Although gravel driveways are the least expensive initially, they require the most maintenance long-term. Annual maintenance includes herbicide application and raking. You’ll need to add more gravel every two to four years, especially if you live in a snowy area or have a sloped driveway. The act of snow removal scrapes up a lot of gravel and deposits it on the sides of the road. You must rake the gravel annually to push it back in place. If you’re willing to keep up with the maintenance, though, gravel is an affordable, durable material and makes an attractive driveway. Below, you’ll find everything you need to know about buying and installing gravel. When installing a gravel driveway, you’ll actually use three sizes of gravel. The first layer of gravel should consist of baseball size rocks, which are often called #3 stones. These rocks form a strong foundation for your driveway and ensure good drainage. This foundation layer also keeps the smaller rock from disappearing into the soil. You’ll install approximately a 4 inch layer of this rock. On top of the base, you’ll install another 3 to 4 inches of golf ball-size rocks, often identified as #57 rocks. These smaller rocks form a similar function and help make the transition to the top layer. The top layer of gravel consists of 4 inches of marble-size rocks. These rocks can vary in color from black to gray to rust, depending on the type of stone. For each layer of gravel, you’ll want machine crushed stone, rather than round rock. These rocks have an angular, triangle shape and will lock together on the driveway. Round rock slips, creating an unstable surface. River rock, for example, is not appropriate for a driveway. When choosing rock for the top layer, choose “traffic bound” or “dense-grade” gravel. This rock has rock dust and smaller pieces of rock added to the mixture. This dust forms a cement-like bond when compacted. Top layer choices for gravel driveways might include crushed shale, limestone, granite and concrete, along with other types of gravel in various colors to meet your aesthetic needs. Choosing the right gravel is important, but proper site preparation is even more vital. Before you lay any gravel, you must remove the top soil and use it somewhere else on your property. The topsoil contains lots of organic matter, which is great for growing plants, but creates a spongy, unstable subsurface for a driveway. Hardpan, the layer beneath topsoil, is, as the name implies, dense and hard. 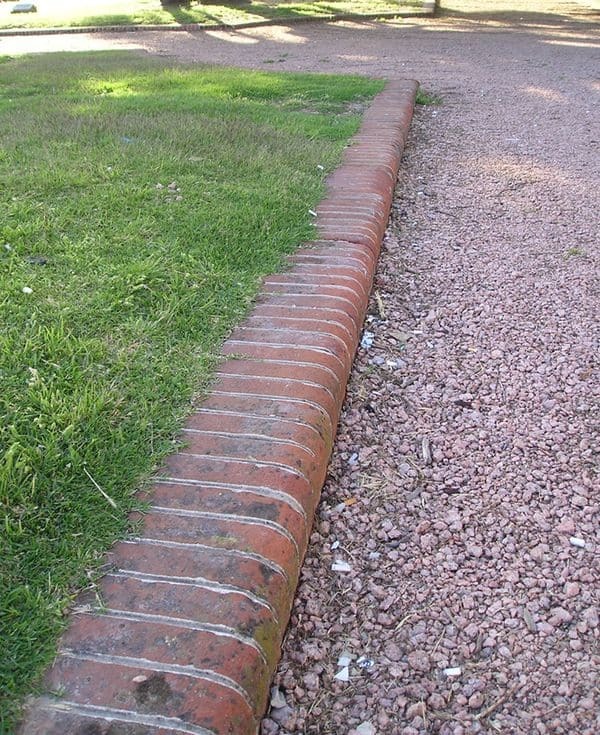 It creates a much better foundation for your driveway. Some people apply an herbicide at this point, while others install landscaping fabric. Think about how you want to address weed control. Proper grading is also critical to the success of your driveway. Gravel driveways need a crown so water drains quickly. A crown simply means that the middle of the driveway is slightly higher than the sides. If you live in an area that gets a lot of rain or snow, you should install ditches on either side of the driveway to carry water away. Once you start laying the gravel, you must compact each layer with a rolling machine before applying the next layer. If all this seems like a lot of work, consider hiring a professional. Installing a gravel driveway is a big task for the average homeowner, but a professional with the right equipment can complete the job in a few days. What’s your favorite type of surface material for a gravel driveway? Leave a comment! I had no idea that gravel consisted of three different sizes of rock. It sounds like there are many benefits of using the three different sizes so making sure that the contractor does it will be important. Getting a sample of what to expect for your gravel driveway would also be important. I was wondering if there is a way to do only two layers and get a fairly decent outcome. We are on a tight budget but the drive desperately needs done. I want a colored (reddish tint) rock for the top, What would the two best sizes for the layers be if we went with only two? It really depends on the stability of the ground. The reason for the big gravel is to establish a non sinking firm base. Support heavy traffic. The medium gravel establishes a grading base so fines don’t work there way through to the bottom. If you have soft ground or the driveway is in a low lying area, don’t skimp on the 4-6″ layer of rock. As an alternative, you can use a strong geo-textile underneath a medium sized gravel, but more often than not, I find it just as expensive, if. It more. I’ve used your fabrics, especially your 160N as a boundary separator, but a better product to substitute for #2 base would be a GeoGrid, not a fabric. I use grid with a 2″ layer of #4 limestone to really lock in place and then 8″ of 411’s and a 2″ layer of 57’s, blended into the surface and packed with a roller or plate depending on the size. The idea is to use a heavy-duty material with a long-life guarantee. It bears the load, don’t diminish the quality of the soil and prevents weeding at the same time. Yes. The base layer can consist of sand and soil mixture….you may have some on property. If not, try to “convince😆” the contractor you need to cut some expense…..show some thigh and wear very short skirts….! On our existing uphill gravel driveway, what size gravel is best to use? Seems as if all gravel used in the past eventually sinks into the driveway. Also how is best way to keep gravel from spreading to the side and off the driveway. In addition to using a heavy roller (or a vehicle) to compact the gravel, use 3/4 or 5/8 minus gravel – the ‘minus’ means it has a fine dust mixed in. This dust will fill the spaces between the gravel and help it to support weight better without moving. I am thinking of using gravel for my driveway. Happy I saw this article, really informative. This will certainly help me in the process. A driveway is a driveway and a road is a road. Meaning your driveway doesn’t get near the traffic a road consumes in its lifetime. Fabric and Geogrid is hard to handle and expensive compared to local stone made for driveways. If you want to try to eleminate a step you could add fines (dusting/screaming) to your 1st layer of base. And then 4”-6” of smaller stone with fines. An important reason for the smaller stone is that it’s less abrasive on the wear and tear of your vehicle(tires), and easier to walk, bike, play, and take care of. All driveways are roads; not all roads are driveways. Semantics aside, a residential driveway should be built on either a foot of #2 Limestone or a layer of appropriate Geogrid. A non-woven geofabric can be used as a boundary separator if appropriate. Then you need 8-12 inches of a product like 304, 411 or 617 Limestone and a final layer of 57 Limestone, about 5-7 tons per 1,000sqft. Everything above the grid, cloth or two’s should be compacted as you go and the surface should be compacted repeatedly until it feels like you’re walking on concrete and the stone movement is minimal when you drive over it. I currently have a loose larger blue stone driveway and am wanting to go to a more compacted driveway. This article was very helpful and gives me information needed when talking to a professional. Having a loose foundation, do we need to have to dig gown and replace with the three layers. Or, can we just add on top of what we have? I want to move my rock driveway, is it worth it for me to scratch my old driveway rock and move it? Or just lay that flat and start over? Thanks for explaining that gravel driveways should actually have three layers of different sizes to help strengthen the foundation and provide good drainage. My husband and I are thinking about installing a gravel driveway soon, so I’ve been doing some research online about the best way to install one. I didn’t know that we’d be installing it in three layers, so I appreciate you explaining that process here!